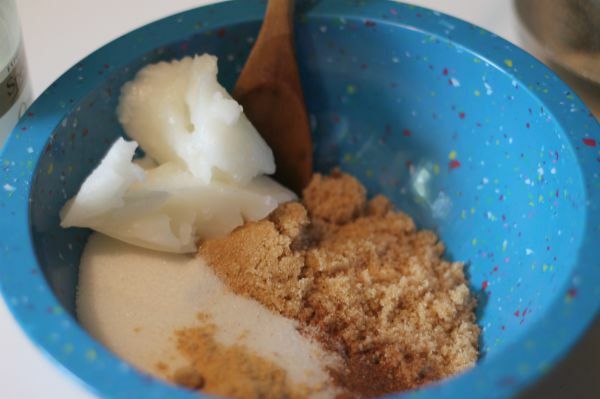 This Gingerbread Homemade Body Scrub is a great choice for fall or winter. It is the perfect time for delicious holiday scents like pumpkin, apple, and of course our favorite gingerbread! Oh, the spicy, wonderful scent of Gingerbread warms up your mood in even the chilliest of temps. Whether you love the flavor of the cookie version or not you will probably flip for the delicious scent of this Gingerbread Body Scrub. This is a perfect way to soothe, moisturize, and soften dry skin due to colder temps and wind, a wonderful spiced aromatic experience, and has ingredients that improve your skin’s appearance long term. First it works to slough away dead skin, then the oils that are left behind absorb and heal your skin like a fancy spa treatment without the cost or the need to even leave your home! 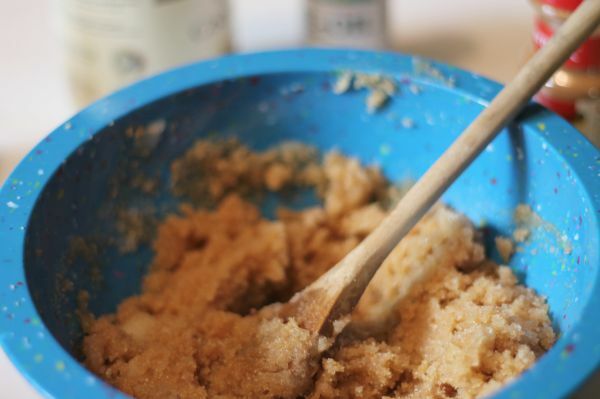 Stir all ingredients in a large bowl until everything is well combined and evenly distributed. Transfer to a jar with a tight fitting lid. 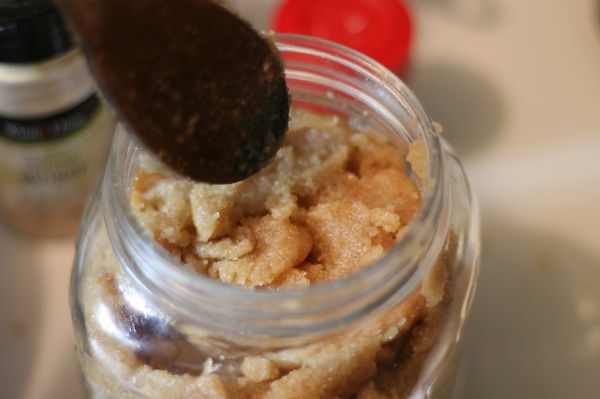 The vitamin E works as a natural preservative so your sugar scrub should last for at least 6-8 weeks if refrigerated between uses, if you decide to give it as a gift be sure to let them know it does have a shelf life. To Use: Rub a generous scoop gently onto wet skin in a circular motion. Rinse away with water and pat skin dry with a towel. Use caution- your shower floor may be slippery from the oils, rinse an extra few minutes to help melt and run coconut oil down the drain. 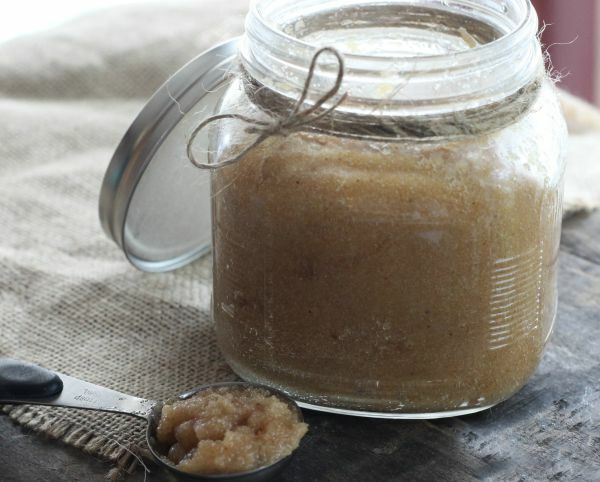 This gingerbread homemade body scrub is a perfect choice for gift giving. Grab some simple plastic jars, ribbon and make your own label to create a gorgeous easy gift everyone will love. Remember you are using ingredients that could potentially spoil, so make in small batches and use within 1-2 weeks if kept out in the open, or within 6-8 weeks if refrigerated between uses. I also recommend being careful and using plastic versus glass jars for storage. A plastic jar won’t break if dropped or knocked over in the bathroom. Just to be on the safe side, make sure you use plastic. We found tons of different colors, sizes an styles at the Dollar Tree in our area. You may even find them online. 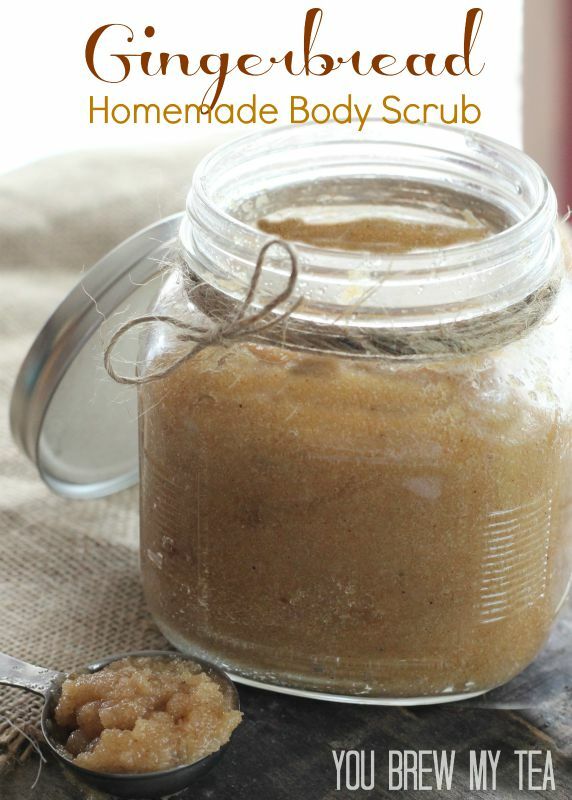 If you are looking for other great DIY beauty products like this gingerbread homemade body scrub, we have tons of great products here for you to check out! I had never tried body scrub until a few months ago when I went to a girly Birthday party. We made our own and it was great fun. The scrub left a clean feeling on your body when used. I really like the smell of gingerbread so this would be a winner !!!! I love this! What a great idea. Would be a lovely little Christmad gift. Oh, I can just smell it now! I love scrubs and I know how easy it is to make because my daughter did some for gifts last year. Looking forward to trying this. I bet this smells amazing! Thank you for sharing with us! I may have to try this recipe! I love this and want to make it asap! But I’m confused…. you mention it will last 6-8 weeks then later say 1-2. Which is correct? will this work with olive or sunflower oil? It will work, but will be a bit more liquid than if made with coconut oil. Coconut oil tends to be more of a solid state in this. I can’t wait to try your gingerbread scrub. Thanks for sharing at the Inspiration Spotlight party. Pinned & sharing.